A lovely flowering woodland plant, Erythronium revolutum are originally from the forests of California through to areas further north . 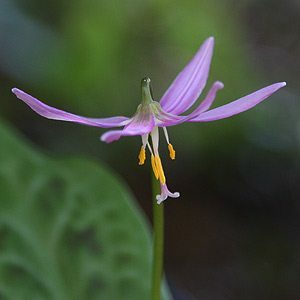 They are sometimes referred to as ‘Fawn Lily’ or ‘Trout Lilies’. These are a spring flowering plant and they prefer a cool part shaded position in a humus rich moist but well drained soil. The pagoda like flowers of these bulbs are very attractive, however the green foliage often with brown or ‘fawn’ mottled markings is a bonus. This species is perhaps the latest of all of the erythroniums to appear in spring. The flowers rise above the foliage and hang down with a ‘pagoda shape’, usually pink. Darker forms (Erythronium revolutum ‘Johnsonii’) are available along with a few named cultivars including ‘rose beauty’ and ‘white beauty’. The reflexed petals which will curve up as the flower matures over a few days, and mottled green foliage are an attractive addition to the garden. These wonderful woodlanders can also be grown in pots and containers in groups of 10 – 15 for a great display. Best in a humus rich moist soil. Part shade with morning sun.